Fresh, easy, and pretty enough for a party–these colorful salads top our list of go-to recipes for summer meals. Give your summer salads a fresh, colorful spin with these quick and easy salad recipes. A few steps and a handful of creative ingredients will wow party guests or add a burst of flavor to any weekday lunch—preferably one eaten al fresco. Beyond the standard bowl of lettuce and salad dressing, we put together unique pairings ideal for a sweet side or a savory meal. Find a taste of the season in our Summer Hoppin’ John Salad, served cool with an assortment of summer’s freshest produce. Grilled fruits and vegetables are also the stars of our Grilled Peach and Avocado Salad and our Smoky Chopped Salad with Avocado. The secret is to grill the peach, lettuce, and avocado just long enough for a smoky infusion. Both salad enthusiasts and the lettuce-averse will want to return to these customizable, quick summer salads again and again. Few things taste better than a BLT, and this delicious salad takes it off the toast and makes it easy to share. That doesn't mean you don't get some delicious crunch here though—you'll still enjoy two delicious treats in this regard. Bake the croutons and bacon together on the same baking sheet. This rustic salad only take 20 minutes to whip up and, trust us, the results are well worth the effort. You might be tempted to go for the store-bought stuff, but homemade buttermilk dressing will really kick this salad up a notch. The assortment of fresh tomatoes means you can keep this salad truly local and seasonal. Enjoying salads means that you've got great ways to bring light, filling meals to the table as all-in-one treats. This vibrant salad is quick to toss together and travels well, which makes it ideal for summer picnics and potlucks. Don't worry, the salad won't wilt when dressed, so make it ahead of time and store it for several hours in the refrigerator. This salad is also a rainbow of color—purple cabbage, white beans, and orange citrus all come together in a fantastic flavor composition that looks and tastes great. An online reviewer described this salad as "perfect for a very warm evening meal." Serve this fresh summer salad with plenty of crusty bread to soak up the flavorful tomato juices. If you can't find heirloom tomatoes near you, don't worry—this salad will be just as delicious with any ripe tomato. This salad has a light white wine vinegar and olive oil vinaigrette that adds just a little sharpness and brings out the delicate flavors of the tomatoes and blends well with the bite of the red onions. You'll get a little cool relief from the chopped fresh basil, chives, parsley, and thyme that get tossed in. Farfalle and fresh veggies make a delicious summer side. Mix the dressing up to three days in advance; then toss when ready to serve. This salad uses three colors of bell peppers, and four different fresh herbs, to bring zest and spice to the fore. We like using mini farfalle in this recipe so that all of the ingredients are about the same size, but you can easily swap in any pasta shape you like. You'll get a little zest from the lemon juice, some heat from the Dijon mustard, and a sharp kick from a little white wine vinegar. It's the unexpected ingredients that give this recipe its special kick and surprise. Scallions, sesame seeds, and a serrano or jalapeño chile all add a little texture and a lot of bite to the crunch and flavor of the tomatoes and cucumbers. The vinaigrette is made with a little rice vinegar and some salty soy sauce, but before serving, sprinkle a pinch of flaky sea salt to add texture to the fresh tomatoes. This is probably the easiest side dish you'll come across this summer, but don't let its ease fool you—it is absolutely packed with fresh, seasonal flavor. This salad begins with simple mixed baby greens, sliced fresh strawberries, and fresh, cool cucumber. But the real treats are the rounds of breaded and fried goat cheese. To prepare the goat cheese croutons, cut a couple of goat cheese logs into rounds. Press each round to 1/2-inch thickness on a baking sheet and freeze for 20 minutes. This process will help the rounds keep their shape and not ooze out of their panko breading while frying. Serve the salad with Strawberry-Poppy Seed Vinaigrette. Add some dill sprigs for garnish, and enjoy every bite of this creamy, crunchy salad sensation. This fantastic salad recipe is courtesy of Rebecca Lang, author of The Southern Vegetable Book: A Root-to-Stalk Guide to the South's Favorite Produce. Radishes at the farmers' market can seem as varied and abundant as the colors of Easter eggs. Two different varieties give this salad vibrant color, texture, and flavor: watermelon radishes and D'Avignon (French breakfast) radishes. If you're looking for a quick-fix try this salad, hands-on time for this recipe is only 20 minutes. Dress this with a mixture of orange juice, honey, and mayonnaise—its combination of sweetness, creaminess, and citrus bite will literally burst forth. Lemon and shallots marry for a bright taste that's ideal for a ladies' lunch or light supper. If you can't find haricots verts, use regular green beans instead. You can also opt for penne pasta, instead of casarecce, if you already have it on hand. We love how quickly this recipe comes together—just 30 minutes! You'll love the bright citrusy flavor paired with the perfect amount of crunch from the green beans. You will also love just that hint of salt from the finely chopped and roasted pistachios. Their flavor will keep this dish a tiny bit savory. "My grandmother always had a bottle of buttermilk in the fridge, and I love how it adds acidity and creaminess to this dressing." - Birmingham chef John Hall. Beets, curly kale, hardcooked eggs, and tangy pickled onions come together to make this salad a winner. Parsley, chives, garlic, and vinegar all season a buttermilk and mayonnaise mixture that combines into a delectable dressing. Serve it as a side for brunch as Hall suggests, or add protein to make it a full meal. We suggest you serve it topped with some buttery French bread croutons to give it even more texture and crunch. Our colorful pasta salad is so satisfying it qualifies as dinner. It also qualifies as a dinner because it is packed with protein—all the shredded meat from a whole deli-cooked chicken, in fact. This is combined with fresh, sliced squash, sliced zucchini, and nectarines, before being tossed with farfalle and the lime vinaigrette. Toasted sliced almonds add texture and crunch. The lime vinaigrette may be a tart temptation, but it also hides a little heat thanks to a tablespoon of Creole mustard. Be ready for it to tantalize your taste buds with just a little sizzle in every bite. This dish starts with a steak, citrus, and spice sensation—Seared Flank Steak with Lime-Wasabi Sauce. Chop this up, and it will brighten up any summer salad. The idea is to lighten up the seared flank steak too by putting it in the salad, and this recipe does precisely that, creating the perfect one-dish meal. You'll find crisp romaine lettuce, creamy blue cheese, firm and ripe kalamata olives, and crisp cucumbers and bell peppers. Tossed together, these are a medley of individual tastes that make an incredible creation. The red onion and two colors of bell peppers bring a fresh heat that the lime-wasabi sauce also suggests, one sitting out in front, the other a subtle suggestion. Both are amazing in this salad. This salad is almost a Greek salad—it has great, fresh and delicious ingredients including grape tomatoes, cucumber, and red onion. Toss these together with feta cheese and fresh herbs to make this simple salad. We've specified Kirby cucumbers in this recipe, which is what we suggest you use if they are available. This type of cucumber is traditionally sold for picking, so it is available unwaxed, and it will have fewer seeds than other cucumbers might. You'll also love its crisp, fresh texture and its light taste. You can have this salad from counter to table in about fifteen minutes, so enjoy this quick-fix salad all summer long. Marinating chicken brings all its flavors to the fore, and this Lemon Vinaigrette helps the process thanks to the acidic nature of the citrus—of course, you'll also be working all the great flavors of Dijon mustard, honey, garlic, and white wine vinegar into your meat. Cooked on medium-high heat, the chicken will be ready in about ten minutes. Char the vegetables next, and both will give this healthy and hearty salad a smoky, sweet flavor. If you prefer, you can easily substitute sliced celery for fennel and pearl barley or wheat berries for farro. Coleslaw might as well be a Southern delicacy as regularly as it is on the table as a favorite side dish. Given its popularity, it is no wonder there are so many ways to get it right. This recipe uses red cabbage, kale, radishes, and carrots, but then throws in a twist with the addition of two types of berries: blueberries and raspberries. We like fresh tarragon in this creamy, zippy dressing, but other herbs work just as well. Dress the salad and let it stand for 30 minutes; it will develop an incredible complexity without losing any of its crispness, freshness, or crunch. Simply adding in wedges of creamy avocado and a fiery buttermilk dressing make this good-for-you pasta salad feel like a hearty meal. The buttermilk dressing gets its heat from some crushed garlic gloves, plus ground red pepper, chili powder, and black pepper—this dressing means business. But it is kept light with low-fat buttermilk, canola mayonnaise, and light sour cream. The recipe is so delicious and so easy to make that you may want to double it. You will probably already have most of the ingredients in your pantry, so it's the perfect solution for a last-minute party or potluck. Serve this dish warm to give a brand-new twist to the old-standard rice salad, or make it ahead, chill, and serve cold. However you decide to dish this tasty salad out, everyone will love the pesto. Rather than use the traditional basil-and-pine nuts approach, this recipe blends mint leaves, jalapeño, garlic, lime, and baby spinach for a fresh, crisp, zesty, and hot homemade version. Stirred into the rice, then topped with baked shrimp and toasted almonds, this recipe brings spice, crunch, and seafood-sweet richness with every mouthwatering bite. Remember, this dish is fantastic warm or cold, so serve it the way you prefer. In the South, Hoppin' John is a New Year's tradition. Hoppin' John is usually served hot, but this cool salad is perfect for a summer picnic or lunch, or as a side salad for grilled meats. This recipe actually begins with Classic Fresh Field Peas, which means it already has the delicious flavors of smoked ham hocks, as well as bacon drippings, mixed in. It just gets more delicious from there. If you have a preference, feel free to substitute your favorite cooked whole grain instead of rice. This is topped with Apple Cider Vinaigrette, so every mouthful has just that little bit of tingle and bite. The grill is not the place many people expect to find their leafy greens, but in fact it is a great way to give them an amazing flavor. What is important is not to leave them on too long. To make this recipe just right, grill the lettuce and avocado just long enough to impart a tinge of smoke. Then, drizzle your salad with a rich and creamy dressing. It's made from buttermilk and sour cream, then flavored with fragrant, fresh herbs and garlic, and spiced with hot sauce and Worcestershire sauce, as well as a little freshly grated Parmesan cheese. You'll get savory, smoky, and creamy flavors and tastes from every forkful. This is definitely not your mother's fruit salad. You will love how fresh and crisp everything in this fruit salad is. A cold, thick, steak-sized slice of ripe watermelon pairs unexpectedly well with beautiful, assorted salad greens, salty Cotija cheese, and a smoky vinaigrette. And to enjoy all these flavor sensations, you won't even have to fire up the grill. You'll get some additional crunch from your choice of salted pepitas or sunflower seeds—both go great with watermelon. For an added taste sensation, try topping this salad with leftover grilled chicken or beef. This incredible—and incredibly tasty—salad brings together four great greens as its main ingredients: Granny Smith apples, asparagus, cabbage, and green onions. There's enough acidity to keep the apples from turning brown if this dish is prepared up to three hours ahead. What's so delightful about this salad is how you use a vegetable peeler to transform asparagus into thin ribbons, a technique that also works well with carrots. Then, add a little bite with some red wine vinegar, and a little sweetness with two tablespoons of honey. You'll love how it all comes together. This crisp summer salad will be cool and refreshing on any table. Few fruits have the true taste of summer like strawberries, and pairing them with tomatoes truly brings the flavors of the season together. Find the best fresh and juicy strawberries at your local farmers' market if you can. Then, look for mini multicolored tomatoes at the supermarket. Toss the two together for a surprising combo to serve with grilled salmon, chicken, or pork. Work in some fresh herbs, then just a little salt and peppery with really bring out the flavor. Stir everything together and this simple salad is ready to serve. This recipe brings together two amazing tastes that are fresh, simple, and easy to get together in the kitchen. Start on the Quick-Pickled Cukes first, so they soak in flavor. The cucumbers and sliced green onions are the perfect combination of garden sweetness and subtle bite. Toss the flank steak on the grill, and when it's ready, slice it into thin strips, arrange it over the incredible cucumbers, and top it with a soy-based sauce rich with garlic and spiced with Asian chili paste. You will be dazzled by this fiery-yet-cool combination of flavors. It's like a cool breeze on a hot evening on the dining table. Sliced snap peas and thin-sliced red onions are the crunchy delights in this summer-fresh side dish. Packed with fresh basil, mint, and parsley, this salad is filled with the aromas and tastes of the garden. You can serve this fragrant side with just about any grilled meat; it plays well off smoky, charred flavors. Toss in some feta cheese and shrimp and you could easily turn this simple side into a main. Drizzle on some homemade Lemon-Shallot Vinaigrette and its zesty flavors will bring out the subtleties of this dish even more. The South is rich with an abundance of fresh peaches during the summer, and it is almost impossible to resist the taste of a ripe peach in a fresh summer salad. This recipe brings the heat and keeps everything hot off the grill and straight to the table. It comes from the kitchen of Paula Jones of Youngsville, North Carolina, courtesy of bellimento.com. "Being originally from Georgia, I love a good peach!" Good they are, paired with the saltiness of Manchego or Parmesan cheese, and the richness of fresh avocadoes. This is a great twist how to use a classic summer fruit. A simple pasta is a genuine Italian classic, so making it a true Southern delight seems like a great idea. This version brings some of our favorite in-season summer vegetables, including corn, baby heirloom tomatoes, zucchini, and bell pepper to the table, then mixes in an unexpected sweet taste—peaches. Add in some shredded smoked chicken and this salad goes from side dish to substantial sensation, taking pride of place as a light-yet-filling summer dinner. Pour on a little Parmesan Vinaigrette for even more subtle Italian flavors, and then sprinkle on some fresh herbs for the finale. You can build the base of this sweet, salty, and crunchy salad with any melon, which means that cantaloupes, honeydew, or even watermelon can be sensations on the table. Consider how each will pair with the crispy prosciutto—the answer will be beautifully regardless—then top the salad with chopped pistachios and crumbled feta cheese. The combination of crisp melon, crunchy prosciutto and pistachios, and the bite of white wine vinegar all result in a salad that is full but not too filling, fresh, and a combination of sweet-yet-salty flavors that are entirely unexpected. Mama always said, 'Eat your greens,' so take that advice and start brunch off with a simple salad. This salad could not get much simpler. It begins with your choice of arugula or, if you prefer, mixed salad greens. The warm vinaigrette, based around the bacon drippings, melts the goat cheese, creating a magical creamy dressing. When it is time for the Arugula with Warm Bacon Vinaigrette to be served, top this mouthwatering delight with more goat cheese, and that crispy bacon. This salad may be all you want to eat for the perfect brunch—just like mama said. Having a fresh, protein-packed summer salad on the table makes entertaining easy and guests satisfied. Grilled Chicken-Asparagus Salad starts with boneless chicken breasts that get grilled to perfection, then chopped, and tossed together with asparagus, cheese, and shallots. The salad gets smoky, salty, and a little spicy seemingly all at once. Since you may want to temper those tastes a little, this hearty salad is brightened up with mint, lemon juice, and fresh dill. Finally, make this salad taste big, and rich, with a mayonnaise-and-buttermilk-based dressing drizzled over the top. Sprinkle on some fresh herbs, and enjoy. This colorful dish captures the best flavors of summer on one cool platter, bringing together the best of melons, summer fruits, and varietal tomatoes. You'll love the distinctive colors and flavors of the green tomatoes, heirloom tomatoes, and baby heirloom tomatoes. The crunch of sliced watermelon will tantalize your taste buds before the rich sweetness of honeydew emerges. A fresh basil dressing spiked with orange marmalade merges the sweet with the savory, and adds a little extra bite thanks to the red wine vinegar and the freshly grated ginger. These truly are the tastes of summer—savor every incredible bite. This recipe is like your honey-can-do list because it shares so many incredible ways honey can make dishes taste delicious. Mixed with white balsamic vinegar and Dijon mustard it transforms into an incredible Honey Dressing; spread over pecans, and seasoned, it turns everyday nuts into the spicy-sweet Honeyed Pecans. Then, when the two are combined, they create the Spinach Salad with Honey Dressing and Honeyed Pecans, a seasonal-greens sensation served on a bed of spinach piled high with fresh berries and sliced red onion. Creamy blue cheese and crispy bacon add two incredible flavors and textures, but it is the "opposites attract" amazement of the spicy Honeyed Pecans that truly steals the show. Since Southerners regard coleslaw as a summer side-dish necessity, new approaches to this picnic table to family formal dinnertime treat are always welcome. This recipe tosses cabbage to the curb in favor of thinly sliced jicama, mint leaves, juicy bell peppers, and Strawberry-Lemonade Jam. This makes for a deliciously refreshing slaw that works well with barbecued meats or for any other occasion where you might find traditional coleslaw on the table. Try this new sensation. You'll love its crunch, its spice, and its little bit of bite, all tempered by the seasonal summer-fruit sweetness of that Strawberry-Lemonade Jam. Grilling peaches is an incredible way to bring the beautiful flavors of their sugars to the fore. You'll love the smoky-sweet flavors you get with these peaches fresh off the grill. To get a truly taste-of-the-south twist on a traditional classic, fresh peaches replace tomatoes in this Southern take on Insalata Caprese. Fresh mozzarella cheese slices bring an incredible creaminess, richness, and depth to the salad, delicately balancing the grilled peaches. A drizzle of cilantro vinaigrette spiked with tequila adds the finishing touch—as well as a fun surprise, a deliciously unexpected taste, and sharp bite. If you're a broccoli salad fan, you'll love the combination of these colorful ingredients. Cook the pasta al dente, so it's firm enough to hold its own when tossed with the tangy-sweet salad dressing. The toasted pecans, mixed with the pasta, grapes, and onions, add just a touch of rich, nutty flavor to the salad. When stirred in, the bacon brings in notes of smokiness. Both the bacon and the pecans are bright spots of crunchiness, but the crisp green beans also have a lot of bite and the perfectly cooked pasta holds its own. This salad gets the balance of sweet and salty just right. Enjoying the bounty of summer produce makes savoring the tastes of the season enticing. This is a great go-to salad when simplicity is a priority. Using bottled vinaigrette makes having a dressing on-hand easy, while preparing the salad itself is a matter of slicing a few items and getting some fresh and delicious ingredients combined. What makes this salad is getting the proportions right; we've used a package of blue cheese for richness and creaminess, and a container of strawberries for sweetness. It's hard to beat this quick-fix salad for the perfect summer side dish. A make-ahead recipe for great chicken salad is like money in the bank when it comes to easy entertaining—and this is one the best. You will marvel at the combination of the crunchy chopped pecans that you've lightly toasted, and finely chopped celery stalks; the creaminess of mayonnaise; and the distinctive flavor and aroma of fresh tarragon. Toss in three cups of chopped cooked chicken this is a homemade chicken salad to savor. A wreath of pencil-thin green beans creates a simple but striking garnish. Keep some in the refrigerator for a summer family lunch and quick picnics or trips to the beach will be ready in a jiffy. Chopped salads are all the rage. The fact that this irresistible combo is super healthy and light is just an added bonus. This is a salad that should be considered when you are planning a menu for entertaining. One online reviewer remarked that it "presents beautifully and is impressive enough to serve to company." This is high praise indeed. You can even turn it into an entrée by topping this Spinach-Grape Chopped Salad with grilled flank steak or steamed shrimp. Served simply, the recipe combines the sweet and savory tastes of grapes and feta cheese; when embellished, the grilled steak or steamed shrimp can add smoky or salty undertones to this fantastic delight. Vinaigrettes are great ways to flavor fruits or vegetables, and to bring distinct flavor profiles to summer salads and side dishes. These Sliced Tomatoes with Fresh Peach Basil Vinaigrette are delicately seasoned. The vinaigrette begins with white balsamic vinegar—because its taste is not too overpowering, then adds in brown sugar, garlic, and basil, and finally gets sweetened with a freshly chopped peach. What results is a simple but unexpected combination of flavors that is absolutely delicious. Regardless of what you flavor with this, you’ll taste how special it is with the very first bite. Served in glass Mason jars, this all-in-one salad is perfect picnic fare. Creating a grab-and-go salad means that guests can serve themselves in a casual and relaxed setting and enjoy the party. Look for Mason jars in the canning section of supermarkets and discount stores, or order online from www.canningpantry.com. This recipe some of the delicious flavors of Thanksgiving and lightens them for summer. Chopped smoked turkey is layered with crumbled cornbread, romaine lettuce, tomatoes, and bell peppers. Crunchy bacon gives this salad a great flavor, and the Parmesan-peppercorn dressing adds just the perfect spicy-salty taste. Pick up a jar and enjoy every savory layer. Spiked with the sweet-sharp heat of a pepper-jelly vinaigrette, ice-cold cubes of watermelon team up with buttery crumbles of Gorgonzola cheese and the fragrant aroma and crisp crunch of toasted pecans. Mâche is a tender, heirloom variety of lamb’s lettuce, but the salad is equally good prepared with a mix of baby lettuces. Our recipe for Pepper Jelly Vinaigrette mixes rice wine vinegar with pepper jelly, lime juice, and grated onion for just the right amount of sweet versus bite. Add this to the salad and you will savor the sweet while loving the heat. This salad elevates the place of the humble packaged ramen noodle soup mix. Rather than boil the noodles, they are toasted, and then spiced, giving them a delicious, definable, crunch. Mixed with the cranberries, vinegars, and soy sauce, they bring a distinctively Asian-inspired sensibility to this dish. Soaking the dried fruits a few minutes before mixing them in will enhance their natural qualities. The chopped walnuts and feta cheese create a harmony of opposites, the crunch of the nuts pairing beautifully with the crumbly cheese. Mixed with gourmet greens, this salad is served lightly dressed and delightfully flavored. Peanutty coleslaw takes a great, simple dish and makes it better. Using a packaged shredded slaw mix for its base, chopped cilantro and green onions get mixed in. Right before this green wonder is ready to be served, lightly salted peanuts get stirred in, adding just the right amount of salt to this crisp and creamy dish. As nutty as it may be, this coleslaw also has a little heat, and may bite, because there are both wasabi paste and grated fresh ginger waiting to entice your taste buds. With all these flavors working their wonders, this crisp coleslaw stands out from the crowd. The third time really is a charm when you put these three delicious salads together. Entertaining is easy with this elegant trio of simple-to-fix party salads. Make-ahead tart shells dress up individual servings of Honey-Chicken Salad rich with chopped cooked chicken and the nutty taste of toasted pecans. Use refrigerated piecrusts, or take a super-shortcut and bake off a package of frozen tart shells. The Shrimp Salad is a summer food staple—the cooking shrimp partner well with sliced green onions, and the ground red pepper is just hot enough. Finally, for a cool summer classic, the fresh tastes of tomato and cucumber, two classic summer vegetables, really bring the flavors of the season to the entertaining table. This rainbow of summer fruit makes an elegant presentation and a refreshing side for a luncheon, brunch, or dinner. It is filled to bursting with the classic flavors of summer fruit: watermelon, honeydew, strawberries, grapes, and peaches. Cut mozzarella adds creaminess, while a garnish of mint and fresh raspberries makes this salad even more crisp, tart, and cool. Layer and chill the salad up to eight hours in advance. Toss a little of the Lemon-Poppy Seed Dressing on just before serving this dish—the Dijon mustard, an unexpected taste, will make the dressing just that perfect mix of sweet and tart. Salads are perfect to serve for almost any occasion, and this Strawberry Fields Salad brings together the sweet and savory tastes of summer. Fresh, ripe orange nectarines add a colorful dash of flavor to this refreshing salad. Layers of greens, strawberries, feta cheese, green tomato, fresh basil, and glazed pecans make for an unbeatable summer salad. If you prefer, you can substitute some miniature green heirloom tomatoes for the single large green tomato. The piquant taste of the green tomatoes will pair well with the creamy, crumbled feta and the sweet, sliced strawberries. Grab some salad servers and enjoy this summer fruit-and-greens delight. Our pasta salad recipes are versatile enough to serve with almost any entrée. Some are even hearty enough to serve as the main dish. Mix and match the ingredients according to what vegetables and pastas you have on hand. Here we with this cheese-filled tortellini pasta salad recipe. Chopped chicken ensures that it is substantial enough to be a summer dinnertime meal. Salty green olives, black olives, crunchy red bell peppers, and onions complement the chicken. A tangy vinegar-based dressing is loaded with herbes de Provence—or a teaspoon of dried Italian seasoning if that's all you have on hand—to coat all of the ingredients with a variety of aromatic flavors. As well as being fresh and delicious, this Citrus-Walnut Salad is incredibly easy to make. If the aroma of toasting walnuts doesn't whet your appetite, the thought of juicy citrus fruits certainly will. The red grapefruit sections add a delicate sweet-and-tart flair to this salad of Belgian endive. A drizzle of homemade flavorful Cumin-Dijon Vinaigrette—a delightful dressing that only uses six ingredients, including a tart white wine vinegar, and a Dijon mustard that will be a little spicy—finishes off this fresh, fruity, and nutty salad. 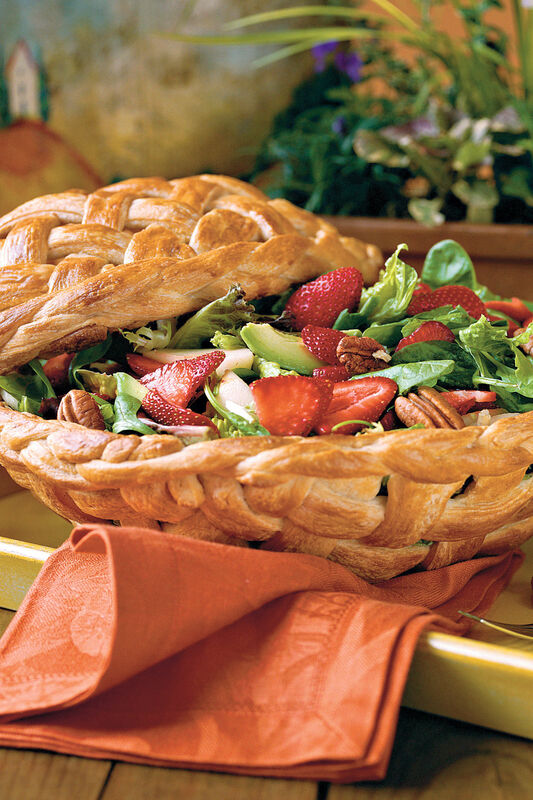 Demonstrating that kitchen innovation can be fun, a festive basket made from refrigerated breadstick dough turns this simple-to-fix salad into a show-stopping centerpiece. The salad itself is hale and hearty, filled with four marinated, grilled chicken breast halves, a quart of strawberries, and pears avocadoes, sweet onion, and pecans. Mixed salad greens are the bed on which this innovative feast is made. This salad is substantial enough to be served as a quick-fix weeknight dinner, and gorgeous enough to be served at a casual dinner party. So get ready for summer entertaining with this Strawberry-Chicken Salad. Potato salad with bacon is a delicious twist on a traditional summer side. This potato salad is chock-full of green onions, celery, and diced pimiento, and blended with a mix of mayonnaise and sour cream. The kicker here is the crumbled bacon. It brings a smoky taste and a bold crunch to this traditionally creamy classic. To spice up the flavors even more, and to jazz up your presentation, serve this salad in paprika-rimmed glasses. (Simply dip the rims in lemon juice, or lime juice, then into paprika.) This makes a great grab-and-go side dish for easy summer entertaining. "Not only will we make it again, but I am telling everyone about it." Those are the words of an online reviewer who absolutely loved the Chicken-and-Strawberry Salad, giving this summer wonder five stars. When you have your first bite of this delicious dish you will understand why. The Chicken-and-Strawberry Salad is a combination of flavors and textures that complement each other perfectly. Creamy avocadoes, sweet strawberry halves, toasted almonds, and thinly sliced red onion all come together in a one-dish supper that is as fresh as it is delicious. Topped with the Poppy Seed Dressing this summer salad is rich and filling. Often chicken salad has grapes, or nuts, but this Chicken Salad with Grapes and Pecans settles the argument about which is best by including them both. Red and green grapes make the perfect sweet addition to this chicken salad. Then, toasted pecans make the chicken salad just the right amount of savory. If you aren’t a fan of nuts, substitute celery for the pecans to ensure a crunchy bite. This recipe can be as rich or as light as you like—you can choose regular or light sour cream and mayonnaise depending on your taste preferences. Serve this as part of a larger salad on lettuce, spread it on some thick, crusty bread for a great chicken salad sandwich, or just pile it on your favorite crackers and relish every mouthful. This salad includes just about everything but the kitchen sink, but feel free to add any extra vegetables or herbs of your choice. Artichoke hearts, roasted red peppers, smoked mozzarella chunks, and chopped green chiles create a great mix of flavors while pine nuts add a finishing crunch. The rotini pasta is perfect for holding the dressing, but substitute the pasta of your choice if desired. We've garnished ours with tomato wedges and baby spinach leaves, but you may want to shave a little more Parmesan on top. And if you make it near the kitchen sink cleanup will be extra-easy. Watermelon-Prosciutto Salad, drizzled with a super-simple homemade vinaigrette, becomes a light summer meal when paired with your favorite appetizer. You'll devour the cool, crisp melon, and savor every bite of the crunchy, smoky prosciutto. The basil, honey, and white balsamic vinegar vinaigrette is an exciting blend of sweet and tart, with the paprika sprinkling in just a little touch of heat which contrasts delightfully with the cool melon. The prosciutto adds in just the right amount of salt. The watercress is the light base of it all—the tiny leaves sop up every drop of the delicious vinaigrette. This chicken salad begins as a traditional dish with celery, minced green onions, and chopped toasted pecans. It then adds some heat to the chicken with a few tablespoons of prepared horseradish, which is a pungent herb that is hot to the taste buds but is not spicy like jalapeños. You can add more or less of the sauce depending on your preference. For an even simpler approach, substitute a deli-cooked chicken for the skinned and boned chicken breasts. This is a great dish for summer get-togethers. Get it ready in advance and it will be ready for your outdoor patio buffet. Something this delicious gives a new meaning to that old children's game "pick-up sticks." These festive party pick-ups get a quick start with refrigerated cheese tortellini. If you’re short on time, simply toss the ingredients together in a pretty bowl and set out some forks. The vinaigrette mixes together tart-yet-sweet white wine vinegar, fresh dill, and Dijon mustard, along with two cloves of fresh garlic. This seasons the tortellini perfectly when it is drizzled over the top—it imbues the tortellini and the snap peas with its sharp flavors, giving each a little bite. This potato salad is as colorful and as beautiful as it is delicious. A mixture of Yukon gold potatoes and sweet potatoes provides a refreshing twist on potato salad. Choose small to medium-size potatoes of similar diameter for this recipe. The potatoes are cut into thick slices, then covered in an olive oil mixture, and topped with lightly salted, roasted pecans and chopped fresh basil. The salty pecans and the fresh basil mesh perfectly with the sweet and rich tastes and textures of the Yukon gold and sweet potatoes. This Lemon-Garlic Potato Salad is as much a side as a salad—but it does not matter what you name it because you'll be too busy devouring it. While the peak apple season may be between September and October, beautiful fresh apples are available as early as July, making this dish a great summer salad. Pears will really come into their own in September, so plan on this being a late-summer salad: put it on the table for the kickoff of football season, or put it together for tailgating. This is a versatile salad: Shredded cheese works just as well as sliced, and if you add grilled chicken, this dish can go from side to main in a matter of minutes. Kick off your late-summer festivities with this great salad. Potato salads may be barbecue, picnic, and summer party staples, so finding new ways to enjoy this favorite dish means more happy faces around the table—or sitting on the picnic blanket. This updated Southern classic is made with a creamy herb mixture that has fewer fat grams but still all the flavor of the traditional recipes. It pairs light mayonnaise with nonfat plain yogurt for all of the creaminess with less fat. Boiling the potatoes in chicken broth also ensures that they are incredibly rich and full of flavor. Once the fresh herbs are added, people will rave about this new summer favorite. Grab a plate and serve yourself. Fresh and crisp will be the words you and your guests use to describe the vegetables in this incredible summer salad. Cooked-to-perfection carrots and peas give just the right crunch in a chicken salad that is unique for its sesame and lime-juice based dressing spiced with crushed red pepper. The toasted sesame seeds add in the perfect crunchy-savory finish. Sprinkle some fresh cilantro on top, and this garden salad is ready to go. While you're at it, you might as well dress a double batch of this light but satisfying dinner. The flavors get even better overnight in the fridge, and leftovers make a gourmet on-the-go lunch. This recipe starts with the taste and beauty of fingerling potatoes and just gets better from there. Cook them with garlic, bay leaves, and rosemary, and they will be infused with incredible flavors and tastes. Then, salami is sautéed until it is crisp, to be used as a crunchy topping just before this salad is served. A sweet-sour dressing with your choice of red wine vinegar or sherry vinegar, Dijon mustard, a syrupy sweet—either sorghum syrup or honey, and some crushed red pepper push this Italian Potato Salad over the top. Serve with our Herb-Roasted Pork Loin. Although there is the perception that orzo is a grain, it is actually an Italian short-cut pasta—it is simply shaped like a grain of rice. This dish has the tart flavor from the juice of several lemons, as well as olive pol and some Dijon mustard. Your choice of shallot or red onion adds even more spicy heat. The key to this crowd-pleasing Spring Pea Orzo salad is to toss the warm pasta with the dressing. Then, the orzo soaks up flavor. You can make it up to two days in advance, and serve any leftovers with ham. Perfectly cooked basmati rice has density, texture, and bite, and is perfect for soaking up the flavors from a subtly seasoned vinaigrette. Ditch a mayonnaise-laden potato salad for this fresh, minty number. This Summer Rice Salad basks in the flavors of fresh lime juice, white wine vinegar, honey, and Dijon mustard. Fresh herbs add even more bold tastes to this liquid delight. Cabbage and cucumbers give the salad texture, color, and crunch, while red bell pepper and green onion suggest just a little bite. Drizzle the versatile dressing over fresh fruit or grilled fish or veggies. It is, in the words of one online review, "Absolutely delicious!" If you're a broccoli salad fan, you'll love this combination of colorful ingredients. Cook the pasta al dente so it's firm enough to hold its own when tossed with the tangy-sweet salad dressing. We've used farfalle, which is a perfect pasta for this dish given its easy-to-manage shape. The broccoli florets are crisp, tender wonders, crunchy and bright. The red grapes provide a bite of sweetness in every mouthful, while the cooked bacon adds a smoky richness. Both the red onion and the red wine vinegar bring subtle hints of bite. This salad is summer in every spoonful. Don't skip the fresh lemon rind and juice in the lemon-basil marinade—it's what makes this salad recipe special, and a citrus-based delight. These large shrimp also make a terrific appetizer. The shrimp and dressing, as well as the Parmesan Baskets, can all be made a day ahead—these need to marinate for 8 hours, they're fantastic if you marinate them for 24. The Fresh Lemon Vinaigrette adds that extra kick: Dijon mustard, garlic, and lemon juice each pack just a little punch, seasoned with a little salt and freshly ground black pepper. Sweet, juicy blueberries are the stars of this quick-toss salad, but it’s equally good (and even more colorful) served with a mix of summer berries, so strawberries or raspberries can be mixed right in. Creamy gorgonzola cheese and walnuts complement the perfect mix of leafy greens. If you prefer, you can substitute pecans. To make this Berry Delicious Summer Salad even simpler, we've used a bottled vinaigrette. Pair this salad with grilled beef, pork, or chicken for a simple but elegant menu that is easy enough to prepare that you can serve it anytime. Shaped in a cake pan and trimmed with a festive border of fresh herbs and berries, Cha-Cha Chicken Salad doubles as a quick and easy centerpiece for summer entertaining. Serve it as a luncheon entrée or as an appetizer with assorted crackers and sliced breads. It is truly a Southern dish—crushed pineapple, dried cranberries, and toasted almonds all come together in a taste sensation, only to be garnished with your choice of fresh berries, or even sliced fresh seasonal peaches. You'll love this dish so much it will have you wanting to dance the cha-cha. Enjoy the Chicken Salad. Brightly colored and lightly flavored with fresh ginger, this Asian-inspired medley of fresh and frozen peas takes just minutes to toss together. Sugar snap peas and snow peas work beautifully when combined. A quick steam leaves them tender yet crisp. Adding in some baby English peas brings a touch of sweetness. Then, toasting either regular or black sesame seeds add in some crunch, as well as a fragrant aroma. The fruit juice and soy sauce mixture provides just the right amount of sauce for a sweet and savory bite with every mouthful.